A local taxi mogul is hoping to set the record for most expensive single-family home ever sold in Queens. 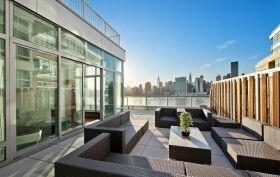 The Long Island City penthouse at 46-30 Center Boulevard is listed for $5.4 million, and the current record is a $3.35 million sale that went through last year in LIC. According to the Daily News, the three-bedroom pad was last purchased for just $2.5 million in 2009. The impressive penthouse features an expansive wraparound terrace, exquisite dark wood floors, and cathedral ceilings.